This CASA Guide is for Version 4.5 of CASA. If you are using a later version of CASA and this is the most recent available guide, then you should be able to use most, if not all, of this casaguide, as we try to limit script breaking changes in CASA development. 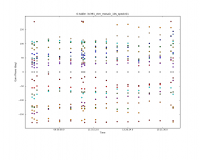 This CASA guide describes the calibration and imaging of a multiple-pointing Jansky VLA continuum dataset on the supernova remnant 3C 391. 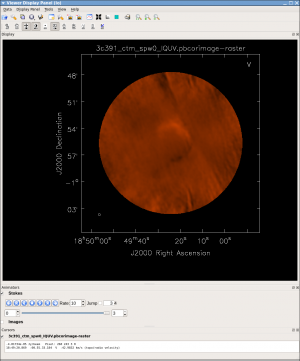 The data were taken in JVLA early science OSRO1 mode, with 128 MHz of bandwidth in each of two widely spaced spectral windows, centered at 4.6 and 7.5 GHz, and were set up for full polarization calibration. Interactively examining task inputs. In this mode, one types taskname to load the task, inp to examine the inputs, and go once those inputs have been set to your satisfaction. Allowed inputs are shown in blue and bad inputs are colored red. The input parameters themselves are changed one by one, e.g., selectdata=T. Screenshots of the inputs to various tasks used in the data reduction below are provided, to illustrate which parameters need to be set. More detailed help can be obtained on any task by typing help taskname. Once a task is run, the set of inputs are stored and can be retrieved via tget taskname; subsequent runs will overwrite the previous tget file. 3C391 C1&#150;C7, which are 7 fields centered on and surrounding the supernova remnant. It is always a good idea, particularly with a new system like the JVLA, to examine the data. Moreover, from the observer's log, we already know that one antenna will need to be flagged because it does not have a C-band receiver. Start by flagging data known to be bad, then examine the data. flagbackup=T : A comment is warranted on the setting of flagbackup (here set to T for True). If set to True, flagdata will save a copy of the existing set of flags before entering any new flags. The setting of flagbackup is therefore a matter of some taste. You could choose not to save any flags or only save major flags, or you could save every flag. Finally, it is common for the array to require a small amount of time to settle down at the start of a scan. Consequently, it has become standard practice to flag the initial samples from the start of each scan. 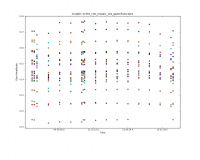 field='0' : The entire dataset is rather large, and different sources have very different amplitudes, so it is advisable to start by loading a subset of the data. You can later loop through the different fields (i.e. sources) and spectral windows using the GUI interface. Task plotms should produce a GUI, with the default view being to show the visibility amplitude as a function of time. Figure 2 shows the result of running plotms without the field selection discussed above (using field=' ' ). Task plotms allows one to select and view the data in many ways. Across the top of the left panel are a set of tabs labeled Plots, Flagging, Tools, Annotator, and Options. The option under the Flagging tab is to Extend flags; thus, even though plotms was started with extendflag=F, if you decide that it does make sense to extend the flags, you can do so here. In the default view, the Plots tab is visible, and there are a number of tabs running down the side of the left hand panel, including Data, Axes, Trans, Cache, Display, Canvas, and Export. These allow you to make changes without having to re-launch plotms. Even if plotms was started with plotfile=' ' , you can save a copy of the plot by selecting the Export tab and entering a file name. At this stage in the data reduction process, the general data editing and examination strategy is to focus is on the calibrators. The reduction strategy is to determine various corrections from the calibrators, then apply these correction factors to the science data. The 3C 286 data look relatively clean in that there are no wildly egregious data (e.g., amplitudes that are 100,000x larger than the rest of the data). One may notice that there are antenna-to-antenna variations (under the Display tab select Colorize by Antenna1). 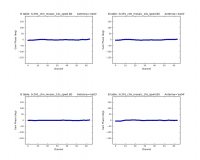 These antenna-to-antenna variations are acceptable, that's what calibration will help determine. 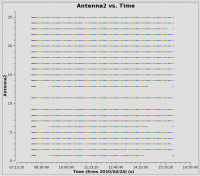 From this display (see Figure 4), you can see that antenna 3 (ea04) is missing the last scan on 3C84 (which will have some implications later on); antennas 1,6, and 13 (ea02,ea08, and ea16) have some missing blocks of time in the middle of the run; and 23 (ea26) is missing a scan or two near the end. It is now time to begin calibrating the data. The general data reduction strategy is to derive a series of scaling factors or corrections from the calibrators, which are then collectively applied to the science data. For more discussion of the philosophy, strategy, and implementation of calibration of synthesis data within CASA, see Synthesis Calibration in the CASA Reference Manual. is the often-neglected baseline term. 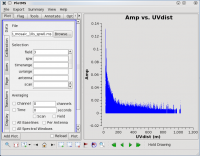 It can be important to include for the highest dynamic range images or shortly after a configuration change at the JVLA, when antenna positions may not be known well. The calculations are inserted via gencal which, since CASA 3.4, allows automated lookup of the corrections. To see how to calculate corrections manually, go to the EVLA/VLA Baseline Corrections site. The observations were taken 24 April 2010, so antennas that were moved BEFORE that date, but whose corrections were not applied before that date, need to be corrected. Note in reading this table a blank in the first column means that the antenna was not moved at that time but has updated locations that need to be applied. One complication specific to this and other observations with the early JVLA (early 2010) is that previous location determinations are not necessarily in the JVLA database, but instead are in the old VLA database, as they were determined before the changeover in Jan 2010. They will have been applied at the time of observation. The next step is to provide a flux density value for the amplitude calibrator J1331+3030 (a.k.a. 3C 286). For the VLA, the ultimate flux density scale at most frequencies was set by 3C 295, which was then transferred to a small number of primary flux density calibrators, including 3C 286. 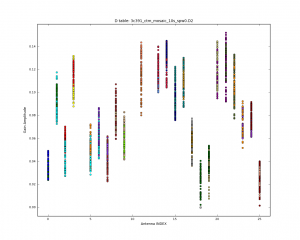 For the JVLA, the flux density scale at most frequencies is determined from WMAP observations of the planet Mars, which, in turn, was then transferred to a small number of primary flux density calibrators. The procedure is to assume that the flux density of a primary calibrator source is known and, by comparison with the observed data for that calibrator, determine the values. standard='Perley-Butler 2013' : The flux density scale at the JVLA is periodically revised, updated, or expanded. The specified value represents the most recent determination of the flux density scale by R. Perley and B. Butler in 2013 (now the default); older scales can also be specified, and might be important if, for example, one was attempting to conduct a careful comparison with a previously published result. 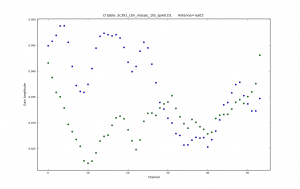 model='3C286_C.im' : From plotms above, it was estimated that 3C 286 is roughly a point source. Depending upon the frequency and configuration, the source may be slightly resolved. Fiducial model images have been determined from a painstaking set of observations, and, if one is available, it should be used to compensate for slight resolution effects. 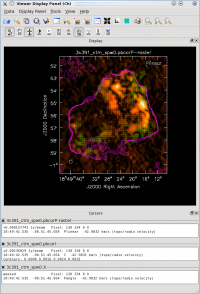 In this case, spectral window 0 (at 4.536 GHz) is in the C-band, so the C-band model image is used. usescratch=False : To save disk spac, we will NOT force the writing of the model visibilities to the MODEL_DATA scratch column. In this case, a model image of a primary flux density calibrator exists. However, for some kinds of polarization calibration or in extreme situations (e.g., there are problems with the scan on the flux density calibrator), it can be useful (or required) to set the flux density of the source explicitly. 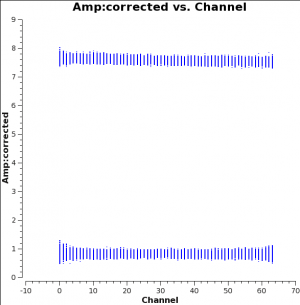 spw='0:27~36' : Choose a subset of the channels from which to determine the gain corrections. These should be near the center of the band, and there should be enough channels chosen so that a reasonable signal-to-noise ratio can be obtained. (See the output of plotms above.) Particularly, at lower frequencies where RFI can manifest itself, one should choose RFI-free frequency channels. Also note that, even though these data have only a single spectral window, the syntax requires specifying the spectral window in order to specify the spectral channels. Use the Next button on the GUI to advance the displayed antenna. In Figure 5 we have stepped through to antenna ea05. NOTE: Sometimes plotcal will lock a table and/or keep it in the table cache beyond the end of plotting. This can hang up further use of that table, or cause errors if you delete the table outside of CASA and want to re-create it. To deal with that issue, simply close the plotcal GUI using the Quit button when you are done looking at the plot. 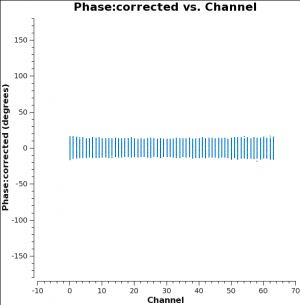 The first stage of bandpass calibration involves solving for the antenna-based delays which put a phase ramp versus frequency channel in each spectral window. The K gain type in gaincal solves for the relative delays of each antenna relative to the reference antenna (parameter refant), so be sure you pick one that is there for this entire scan and good. This is not a full global delay, but gives one value per spw per polarization. gaintable=['3c391_ctm_mosaic_10s_spw0.antpos','3c391_ctm_mosaic_10s_spw0.G0'] : Use the antpos and G0 tables. 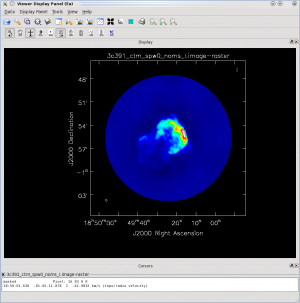 These are within about 4 nanoseconds, as expected for the early JVLA science observations. solint='inf', combine='scan' : This observation contains multiple scans on the bandpass calibrator, J1331+3030. Because these are continuum observations, it is probably acceptable to combine all the scans and compute one bandpass correction per antenna, which is achieved by the combination of 'solint='inf' and combine='scan' . Had combine=' ' then there would have been a bandpass correction derived per scan, which might be necessary for the highest dynamic range spectral line observations. 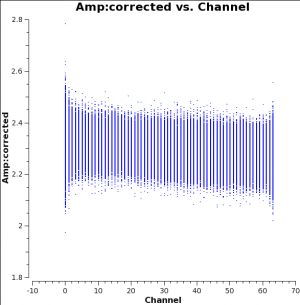 bandtype='B' : The bandpass solution will be derived on a channel-by-channel basis. There is an alternate, somewhat experimental option of parameter bandtype='BPOLY' that will attempt to fit an nth order polynomial to the bandpass. gaintable=['3c391_ctm_mosaic_10s_spw0.antpos','3c391_ctm_mosaic_10s_spw0.G0','3c391_ctm_mosaic_10s_spw0.K0'] : Pre-apply antenna positions, phase solutions, and delays. Once again, one can use plotcal to display the bandpass solutions. Note that in the plotcal inputs below, the amplitudes are being displayed as a function of frequency channel and, for compactness, parameter subplot=221 is used to display multiple plots per page; you could have used paramter yaxis='phase' to view the phases as well. 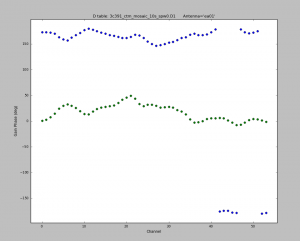 Parameter iteration='antenna' is used to step through separate plots for each antenna. 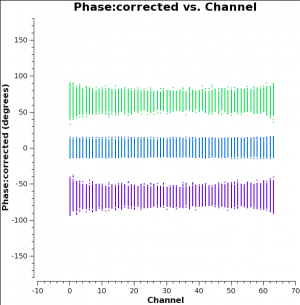 As expected, the bandpass phases are relatively flat (see Figures 8A&#150;8D), with the slopes removed by the delay calibration. Residual excursions are on the order of a few degrees. The next step is to derive corrections for the complex antenna gains, and . As discussed above, the absolute magnitude of the gain amplitudes&#151; &#151;are determined by reference to a standard flux density calibrator. In order to determine the appropriate complex gains for the target source, and to minimize differences through the atmosphere (neutral and/or ionized) between the lines of sight to the phase calibrator and the target source, you want to observe a so-called phase calibrator that is much closer to the target. 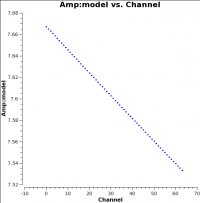 If we establish the relative gain amplitudes and phases for different antennas using the phase calibrator, we can later determine the absolute flux density scale by comparing the gain amplitudes, , derived for 3C 286 with those derived for the phase calibrator. This will eventually be done using the task fluxscale. Since there is no such thing as absolute phase, we determine a zero phase by selecting a reference antenna for which the gain phase is defined to be zero. gaintable=['3c391_ctm_mosaic_10s_spw0.antpos','3c391_ctm_mosaic_10s_spw0.K0','3c391_ctm_mosaic_10s_spw0.B0'] : Use the antenna position corrections, delays, and bandpass solutions determined earlier before solving for the gain amplitudes. If one checks the gain phase solutions using plotcal, one should see smooth solutions for each antenna as a function of time (see Figures 9A&#150;9D). Having set the complex gains, we now need to do the polarization calibration. This should be done prior to running fluxscale, since it has to run using the un-rescaled gains in the MODEL_DATA column of the measurement set. Polarization calibration is done in two steps. First, we solve for the instrumental polarization (the frequency-dependent leakage terms ('D-terms')), using either an unpolarized source or a source which has sufficiently good parallactic angle coverage. Second, we solve for the polarization position angle using a source with a known polarization position angle (3C 286 is recommended here). 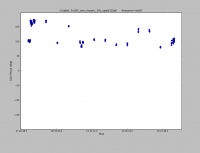 The initial run of setjy only set the total intensity of our flux calibrator source, 3C 286. This source is known to have a fairly stable fractional polarization (measured to be 11.2% in C-band around the time of the observations), and a polarization position angle of 33 degrees (at most frequencies). 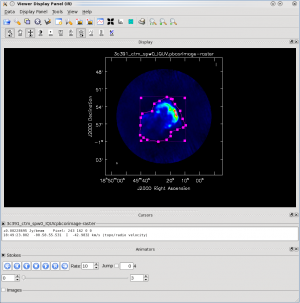 For information on polarization calibrators suitable for VLA observations, see the VLA Observing Guide on Polarimetry. The most recently determined values, in a table at the bottom of the Polarimetry guide page, give 11.3% at 4.5GHz, but we use the old value of 11.2% for consistency with the rest of the guide. We now set the values of Stokes I, Q and U for 3C 286, using setjy using the above values. standard='manual' : The user will supply the flux densities rather than giving a model. 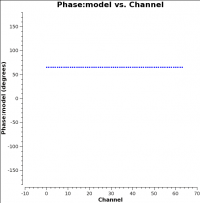 fluxdensity=[i0,q0,u0,0] : Use the IQUV values for channel 0 calculated above. spix=alpha : Set the spectral index using the formula above (this will also apply to QU). reffreq='4536.0MHz' : This is the frequency of channel 0 from listobs. scalebychan=True : This will let it compute a value per channel. usescratch=False : DO NOT create/use the MODEL_DATA column explicitly. Note: With CASA 4.2 the setjy task parameters have changed, in particular the use of standard='manual' to specify flux densities. CASA 4.3 added the polindex, polangle and rotmeas capability, although as of 4.3.1 it will not work correctly for all values of polangle and thus is still experimental. Beware when following this guide with earlier versions of CASA. Just as we did for the parallel-hand (RR,LL) delays before bandpass calibration, we solve for the cross-hand (RL,LR) delays due to the residual delay difference between the R and L on the reference antenna (ea21) used for the original delay calibration. In our case, we simply use 3C286, which has a strong polarized signal in the RL,LR correlations. As expected there is a single value for R versus L (with L delay set to zero) across all antennas. The solution is reported in the logger, and is 7.149 nsec. poltype='Df' : Solve for the leakages (D) on a per-channel basis (f), assuming zero source polarization. interp=['linear','nearest','nearest','linear','nearest'] : The interpolation to be used for each gaintable. Note that there are no solutions for antenna ea04&#151 (see Figure 15);a bit of sleuthing will turn up that ea04 was missing for the scans on 3C84. While we know the flux density of our primary calibrator (J1331+3030 3C 286), the model assumed for the secondary calibrator (J1822-0938) was a point source of 1 Jy located at the phase center. 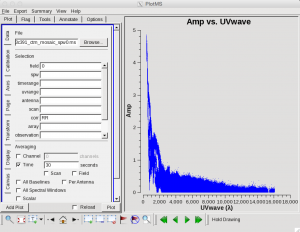 While the secondary calibrator was chosen to be a point source (at least, over some limited range of uv-distance; see the VLA calibrator manual for any u-v restrictions on your calibrator of choice at the observing frequency), its absolute flux density is unknown. Being point-like, secondary calibrators typically vary on timescales of months to years, in some cases by up to 50&#150;100%. incremental=False : Make a new output fluxtable replacing caltable with rescaled transfer gains. If parameter incremental=True then the new table would be used in addition to caltable in subsequent applications. Another nice display is to use plotms to plot the amplitude and phase of the CORRECTED_DATA column against one another, for one of the parallel-hand correlations (RR or LL; the signal in the cross-hands, RL and LR, is much smaller and will be noise-like for an unpolarized calibrator). This should then show a nice ball of visibilities, with some scatter, centered at zero phase and the amplitude found for that source in fluxscale. An example is shown in Figure 20. The and coordinates are the baselines measured in units of the observing wavelength, while the and coordinates are the direction cosines on the sky. For generality, the sky coordinates are written in terms of direction cosines, but for most JVLA (and ALMA) observations they can be related simply to the right ascension ( ) and declination ( ). Also recall that this equation is valid only if the coordinate of the baselines can be neglected. This assumption is almost always true at high frequencies and smaller JVLA configurations (such as the 4.6 GHz D-configuration observations here). The coordinate cannot be neglected at lower frequencies and larger configurations (e.g., 0.33 GHz, A-configuration observations). This expression also neglects other factors, such as the shape of the primary beam. For more information on imaging, see Synthesis Imaging within the CASA Reference Manual. CASA has a single task, clean which both Fourier transforms the data and deconvolves the resulting image. For the purposes of this tutorial (Part 1), we will make a simple mosaic clean image in Stokes I only. 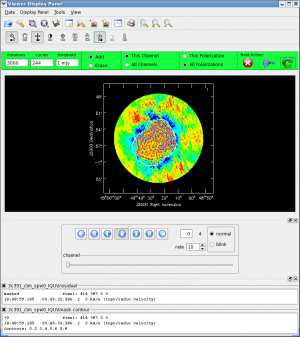 In Advance Topics (Part 2), we will proceed to make multiscale mosaic images in IQUV and to analyze them. You should obtain a plot similar to Figure 21 with the (calibrated) visibility amplitude as a function of - distance. The maximum baseline is about 16,000 wavelengths, i.e., an angular scale of 12 arcseconds ( ). The most effective cleaning occurs with 3&#150;5 pixels across the synthesized beam. For example, a cell size of 2.5 arcseconds will give just under 5 pixels per beam. The supernova remnant itself is known to have a diameter of order 9 arcminutes, corresponding to about 216 pixels for the chosen cell size. The mosaic was set up with 7 fields, 1 centered on the remnant and 6 flanking fields; the spacing of the fields was chosen based on the size of the antenna primary beam. For the choice of ftmachine='mosaic' (our main mosaicking algorithm), you do not have to fit the mosaic inside the inner quarter of the total image in order to prevent image artifacts arising from aliasing, we just want to have a bit of padding around the outside. Although CASA has the feature that its Fourier transform engine (FFTW) does not require a strict power of 2 for the number of linear pixels in a given image axis, it is somewhat more efficient if the number of pixels on a side is a composite number divisible by any pair of 2 and 3 and/or 5. Because clean internally applies a padding of 1.2 (=3x2/5) choose 480, which is 25 × 3 × 5 (so 480 × 1.2 = 576 = 26 × 32). We therefore set imsize=[480,480] and our mosaic fits comfortably inside the image. Task clean is powerful with many inputs and a certain amount of experimentation likely is required. vis='3c391_ctm_mosaic_spw0.ms' : this split MS contains our 7-pt mosaic fields, now indexed as 0&#150;6. Field 0 is the central field of the mosaic (you can use listobs to verify this). niter=25000,gain=0.1,threshold='1.0mJy' : Recall that the clean gain is the amount by which a clean component is subtracted during the cleaning process. Parameters niter and threshold are (coupled) means of determining when to stop the cleaning process, with niter specifying to find and subtract that many clean components while threshold specifies a minimum flux density threshold a clean component can have before clean stops. See also interactive below. Imaging is an iterative process, and to set the threshold and number of iterations, it is usually wise to clean interactively in the first instance, stopping when spurious emission from sidelobes (arising from gain errors) dominates the residual emission in the field. 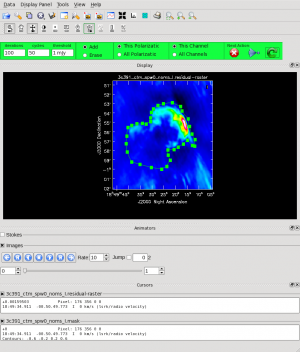 Here, we have used our experience in interactive mode to set a threshold level based on the rms noise in the resulting image. The number of iterations should then be set high enough to reach this threshold. usescratch=False : As in calibration, we will NOT require use of a physical MODEL_DATA scratch column. As mentioned above, we can guide the clean process by allowing it to find clean components only within a user-specified region. The easiest way to do this is via interactive clean. When clean runs in interactive mode, a viewer window will pop up as shown in Figure 22. To get a more detailed view of the central regions containing the emission, zoom in by tracing out a rectangle with the left mouse button and double-clicking inside the zoom box you just made. Play with the color scale to bring out the emission better, by holding down the middle mouse button and moving it around. To create a clean box (a region within which components may be found), hold down the right mouse button and trace out a rectangle around the source, then double-click inside that rectangle to set it as a box. Note that the clean box must turn white for it to be registered; if the box is not white, it has not been set! Alternatively, you can trace out a more custom shape to better enclose the irregular outline of the supernova remnant. To do that, right-click on the closed polygonal icon. Then trace out a shape by right-clicking where you want the corners of that shape. Once you have come full circle, the shape will be traced out in green, with small squares at the corners. Double-click inside this region and the green outline will turn white. You have now set the clean region. If you have made a mistake with your clean box, click on the Erase button, trace out a rectangle around your erroneous region, and double-click inside that rectangle. You can also set multiple clean regions. By default, all clean regions will apply only to the plane shown. To change this to select all planes, click the All Channels button at the top (we have only a single mfs (multi-frequency synthesis) channel in the image cube), and likewise for Stokes planes using the All Polarizations (you will need to set this when we image all the Stokes). At any stage in the cleaning, you can adjust the number of iterations that clean will do before returning to the GUI. By default this is set to 100 (see the iterations field in mid-upper left of panel). You probably want to set this to a high number for this mosaic due to the complicated structure, values from 1000 to 5000 later on seem to work. Note that this will override the niter that was set when you started the clean task. Clean will keep going until it reaches threshold or runs out of cycles (the cycles field to the right of the iterations). When you are happy with the clean regions, press the green circular arrow button on the far right to continue deconvolution. After completing a cycle, a revised image will come up. As the brightest points are removed from the image (cleaned off), fainter emission may show up. You can adjust the clean boxes each cycle, to enclose all real emission. After many cycles, when only noise is left, you can hit the red and white cross icon to stop cleaning. Figure 23 shows the interactive clean panel later in the process, after cleaning around 3000 iterations. At this point we have used the polygon tool to draw around the emission. There is still signal left in the residual, and it would take forever to clean all that out using our standard clean! You should just quit after doing around 10000&#150;20000 iterations total. We'll improve this in the next part of the tutorial. This will bring up a viewer window containing the image (see Figure 24). You can adjust the color scale and zoom in to a selected region by assigning mouse buttons to the icons immediately above the image (hover over the icons to get a description of what they do). Note that the image is cut off in a circular fashion at the edges, corresponding to the default minimum primary beam response (minpb) within clean of 0.2. As we saw during the interactive cleaning, this single-scale delta-function cleaning is having problems cleaning out the large-scale emission. You can see the large clean bowl of negative emission surrounding the object, and the heavy pixelization of the emission at low levels. We'll try to improve on this in the next part of the tutorial. stokes='IQUV', psfmode='clarkstokes' : Separate images will be made in all four polarizations (total intensity I, linear polarizations Q and U, and circular polarization V), and, with parameter psfmode='clarkstokes' , the Clark clean algorithm will deconvolve each Stokes plane separately thereby making the polarization image more independent of the total intensity. pbcor=False : by default pbcor=False and a flat-noise image is produced. We can do the primary beam correction later (see below). As previously, we guide the clean using polygon regions in the interactive clean GUI. Because we now have the four Stokes planes in the image for IQUV, you should be sure to extend the mask you draw by selecting the All Polarizations radio button before drawing the mask. As you clean, you can use the tape deck controls to examine the residuals in the QUV planes. In practice, those will reach the 1 mJy threshold fairly quickly and not be cleaned further while the I cleaning proceeds for a long time. In Figures 25 & 26, you can see that the multiscale clean is doing a better job of picking up the larger-scale emission. 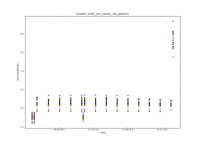 After about 15000 iterations (Figure 26) the residuals were looking pretty good. As mentioned above restarting clean with different multiscale=[...] choices can help also. The tape deck control that you see under (or adjacent to) the image can be used to step through the different Stokes parameters (I,Q,U,V). You can adjust the color scale and zoom in to a selected region by assigning mouse buttons to the icons immediately above the image (hover over the icons to get a description of what they do). Also, using the wrench panel to change Display Options will be helpful here. In the I Stokes plane (1) (Figure 27) we chose the Hot Metal 1 colormap. In Figure 28, showing the V Stokes plane (3) we also set the scaling power cycles to −1.5 to enhance low-contrast emission. Our Stokes I image is significantly better than with just a delta-function classic clean. You can also explore the Q and U images, but we will produce more intuitive images from these later on. Finally, note that the residual emission in Stokes V is not real, but likely due to the JVLA beam squint between R and L (they are slightly separated on the sky, and this is not currently compensated for in our production version of clean). This topic is perhaps not advanced, but it appears to fit more naturally here. It is assumed that an image 3c391_ctm_spw0_IQUV.image, resulting from the above clean, exists. The three most basic analyses are to determine the peak brightness, the flux density, and the image noise level. These are useful measures of how well the imaging efforts are in approaching the thermal noise limit or in reproducing what is already known about a source. Additional discussion of image analysis and manipulation, including the combination of multiple images, mathematical operations on images, and much more can be found in Image Analysis in the CASA Reference Book. stokes=' ' : This example determines the peak brightness in the entire image, which has all four Stokes planes. To determine the peak brightness in just the Stokes V image, for example, then set parameter stokes='V' . and so the peak flux density is 0.154 Jy/beam (likely in the I Stokes plane). One can choose the function assigned to each mouse button; after zooming into the desired view, assign polygon region to a desired mouse button (e.g., left button) by selecting the polygon tool to create the polygonal region as shown in Figure 30 with the desired mouse button. 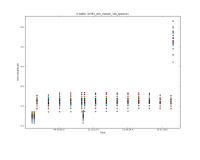 In our example we find a total Flux density of 8.5 Jy while the max brightness is only 0.0173 Jy/beam. Note that the numbers you get may be slightly different depending on how deeply you cleaned. Thus the I rms is 1.6 mJy and Q and U rms are around 0.15 mJy. It will be useful later on to have the flat-noise and pb-corrected images available separately along with the statistics. At the beginning of this Advanced Tutorial, a full polarization imaging cube of 3C391 was constructed. This cube has 3 dimensions, the standard two angular dimensions (right ascension, declination) and a third dimension containing the polarization information. 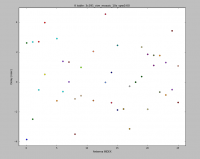 Considering the image cube as a matrix, , the and axis describe the sky brightness or intensity for the given axis. If one opens the viewer and loads the 3C391 continuum image, the default view contains an animator or pane with movie controls. One can step through the polarization axis, displaying the images for the different polarizations. As created, the image contains four polarizations, one for each of the four Stokes parameters: I, Q, U, and V. Recall that Stokes Q and U describe linear polarization and V describes circular polarization. Specifically, Q describes the amount of linear polarization aligned with a given axis, and U describes the amount of linear polarization at a 45 deg angle to that axis. The V parameter describes the amount of circular polarization, with the sign (positive or negative) describing the sense of the circular polarization (right- or left-hand circularly polarized). Few celestial sources, with the notable exception of masers, are expected to show circular polarization. Terrestrial and satellite sources, however, are often highly circularly polarized. The V image is therefore often worth forming because any V emission could be indicative of unflagged RFI within the data (or problems with the calibration!). Because the Q and U images both describe the amount of linear polarization, it is more common to work with a linear polarization intensity image, . ( can also be denoted by .) Also important can be the polarization position angle . The relevant task is immath, with specific examples for processing of polarization images given in Polarization Manipulation. The steps are the following. 1. Extract the I, Q, U, V planes from the full Stokes image cube, forming separate images for each Stokes parameter. Use the flat-noise images so that non-uniform noise does not bias us. 2. Combine the Q and U images using the parameter mode='poli' of immath to form the linear polarization image. Because P is formed from the sum of the squares of the Q and U values, it is biased by the noise. In principle, one can set the sigma value to debias this (it subtracts the square of this value from the Q2+U2 before taking the square-root). To avoid displaying the position angle of noise, we can set a threshold intensity of the linear polarization for above which we wish to calculate the polarization angle, using the parameter polithresh. An appropriate level here might be the level of around 0.2 mJy/beam. 4. If desired, form the fractional linear polarization image, defined as P/I. We can do this on the flat-noise image. with the expression in square brackets setting the threshold in IM0 (the total intensity image). Note that IM0, IM1 and IM2 correspond to the three files listed in the imagename array, in that order. The order in which the different images are specified are once again critical. One can then view these various images using viewer. It is instructive to display the I, P and X images (total intensity, total linearly polarized intensity, and polarization position angle) together, to show how the polarized emission relates to the total intensity, and how the magnetic field is structured. We can do this using the viewer. Next, load the pb-corrected total intensity image as a contour image. In the viewer panel, press the Open icon (the leftmost button in the top row of icons in the viewer). This will bring up a Load Data GUI showing all images and MS in the current directory. 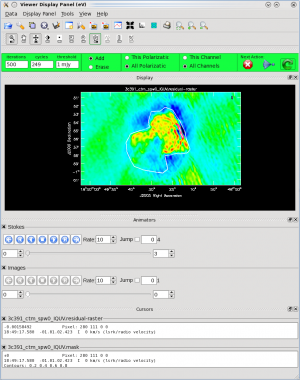 Select the total intensity image (3c391_ctm_spw0.pbcorI) and click the Contour Map button on the right hand side. Finally, load the polarization position angle image (3c391_ctm_spw0.X) as a vector map. 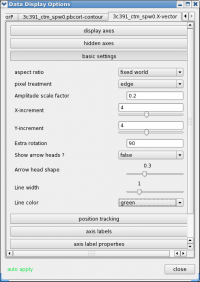 into the LEL Expression box in the GUI, and click the Vector Map button. This would load the vectors only for regions where mJy. While we now have all three images loaded into the viewer (the polarized intensity (3c391_ctm_spw0.pbcorP) in color, the total intensity (3c391_ctm_spw0.pbcorI) as a contour map, and the polarization position angle (3c391_ctm_spw0.X) as a vector map), we still wish to optimize the display for ease of interpretation. Click the wrench icon to open a Data Display Options GUI. This will have 3 tabs, corresponding to the three images loaded (Figures 31A&#150;31C). Change the image transfer function. Hold down the middle mouse button and move the mouse until the color scale is optimized for the display of the polarized intensity. 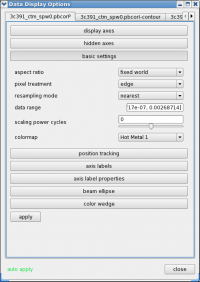 You can change the colormap (e.g., to HotMetal1) in the first tab of the Data Display Options GUI. Change the contour levels. Select the total intensity tab (3c391_ctm_spw0.pbcorI) (2nd tab) in the Data Display Options GUI. Change the relative contour levels from the default levels of [0.2,0.4,0.6,0.8,1.0] to powers of , including a couple of negative contours at the beginning to demonstrate the image quality. An appropriate set of levels might be [-1.414,-1,1,1.414,2,2.828,4,5.657,8,11.314,16,22.627,32,45.255,64]. These levels will multiply the Unit Contour Level, which we set at some multiple of the rms noise in the total intensity image. An appropriate value might be 0.004 Jy ( of pbcorI rms in the outer part of the mosaic). Choose a nice contour color (e.g., magenta). Change the vector spacing and color and rotate the vectors. The polarization position angle as calculated is the electric vector position angle (EVPA). If we are interested in the orientation of the magnetic field, then for an optically thin source, the magnetic field orientation is perpendicular to the EVPA, so we must rotate the vectors by . Select the vector image tab in the Data Display Options GUI (labeled as the LEL expression we entered in the Load Data GUI) and enter 90 in the Extra rotation field. If the vectors appear too densely packed on the image, change the spacing of the vectors by setting X-increment and Y-increment to a larger value (4 might be appropriate here). Finally, to be able to distinguish the vectors from the total intensity contours, change the color of the vectors by selecting a different Line color (green might be a good choice). Now that we have altered the display to our satisfaction, it remains only to zoom in to the region containing the emission. 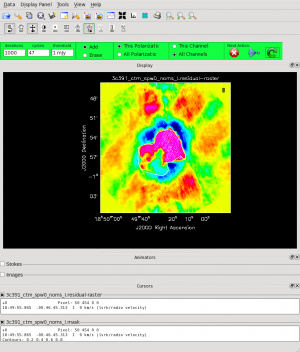 Close the animator tab in the viewer, and then drag out a rectangular region around the supernova remnant with your left mouse button. Double-click to zoom in to that region. This will give you a final image looking something like Figure 31D. Your image may very depending on how deep you cleaned. The spectral index, defined as the slope of the radio spectrum between two different frequencies, , is a useful analytical tool which can convey information about the emission mechanism, the optical depth of the source or the underlying energy distribution of synchrotron-radiating electrons. 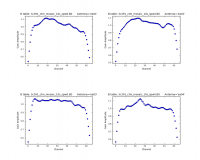 Having used immath to manipulate the polarization images, the reader should now have some familiarity with performing mathematical operations within CASA. 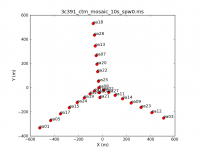 Task immath also has a special mode for calculating the spectral index, mode='spix' . 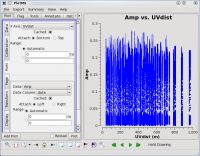 The two input images at different frequencies should be provided using the parameter imagename (which is a Python list). With this information, it is left as an exercise for the reader to create a spectral index map. 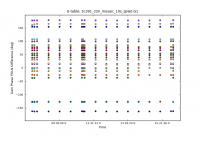 The two input images could be the two different spectral windows from the 3C391 continuum data set (see below). If the higher-frequency spectral window (spw1) has not yet been reduced, then two images made with different channel ranges from the lower spectral window, spw0, should suffice. In this latter case, the extreme upper and lower channels are suggested, to provide a sufficient lever arm in frequency to measure a believable spectral index. Note: It would be desirable to produce the spectral index image through the first-order Taylor term expansion in the MFS imaging. This is unfortunately not available with mosaics in the current version of CASA. Stay tuned. 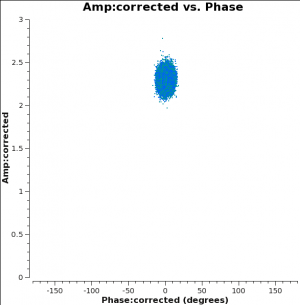 Even after the initial calibration using the amplitude calibrator and the phase calibrator, there are likely to be residual phase and/or amplitude errors in the data. Self-calibration is the process of using an existing model, often constructed from imaging the data itself, provided that sufficient visibility data have been obtained. This is essentially always the case with the JVLA data, the system of equations is wildly over-constrained for the number of unknowns. Produce an image (clean) using the CORRECTED_DATA column. The following example begins with the standard data set, 3c391_ctm_mosaic_spw0.ms (resulting from the steps above). 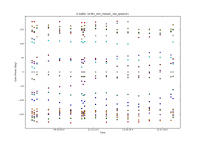 From this we will make an I-only multiscale image (3c391_ctm_spw0_I.image)&#151;and in particular the model (3c391_ctm_spw0_I.model)&#151;to generate a series of gain corrections that will be stored in 3C391_ctm_mosaic_spw0.selfcal1. 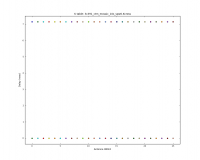 These gain corrections are then applied to the data to form a set of self-calibrated data, and a new image is then formed (3c391_ctm_spw0_IQUV_selfcal1.image). Note that in the clean before the self-cal, it is important that we only image I so that any cleaned polarization does not affect the gaincal. 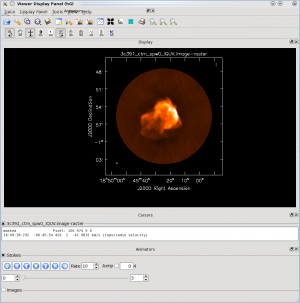 In CASA 4.0 we first use delmod on the MS to get rid of the previous polarized model. You shouldn't have to clean extremely deep. You want to be sure to capture as much of the source total flux density as possible, but not include low-level questionable features or sub-structure (ripples) that might be due to calibration or clean artifacts. The CORRECTED_DATA column of the MS now contains the self-calibrated visibilities, they will now be used by clean. Note that the gaincal step will report a number of solutions with insufficient SNR. By default, with parameter applymode='calflag' , data with no good solutions will be flagged by applycal; in this case you will see it report the flagged fraction increasing from 28% to 43%. This may or may not be a good thing. You can control the action of applycal in this regard by changing the value of parameter applymode by setting applymode='calflagstrict' will be even more stringent about flagging things without valid calibration, while applymode='calonly' will calibrate those with solutions while passing through data without unchanged. Note that you can see ahead of time what applycal will do by running with applymode='trial' which will do the reporting but nothing else. Is this better than the original IQUV image cube? By how much? Commonly, this self-cal procedure is applied multiple times. 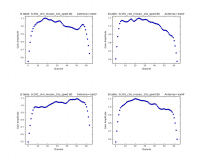 The number of iterations is determined by a combination of the data quality and number of antennas in the array, the structure of the source, the extent to which the original self-calibration assumptions are valid, and the user's patience. With reference to the original self-calibration equation above, if the observed visibility data cannot be modeled well by this equation, no amount of self-calibration will help. A not-uncommon limitation for moderately high dynamic range imaging is that there may be >baseline-based factors that modify the true visibility. If the corruptions to the true visibility cannot be modeled as antenna-based, as they are above, self-calibration won't help. Be careful when making images and setting clean regions or masks. Self-calibration assumes that the model is perfect. If one cleans a noise bump, self-calibration will quite happily try to adjust the gains so that the CORRECTED_DATA describe a source at the location of the noise bump. As the author demonstrated to himself during the writing of his thesis, it is quite possible to take completely noisy data and manufacture a source. It is far better to exclude some feature of a source or a weak source from initial cleaning and conduct another round of self-calibration than to create an artificial source. If a real source is excluded from initial cleaning, it will continue to be present in subsequent iterations of self-calibration; if it's not a real source, one probably isn't interested in it anyway. You can find the data in the CASA repository. Both datasets&#151;3C391 spw 1 (at 7.5 GHz) and Supernova Remnant G93.3+6.9 at L-band&#151;are contained in this tarball. To keep their sizes small, these MSs do not have the scratch columns pre-made, so you can do an initial clearcal to force the creation of the scratch colums or wait until your first calibration task does it for you. 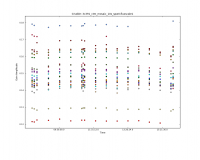 This is the second spectral window split off from the 3C391 dataset. You can process this as you did the first time, but beware of RFI in this band. You will have to avoid it through channel ranges and/or edit it out. Once you have processed this data and imaged it, you can combine those images in immath to make a spectral index image (see above) or combine the two calibrated MSs in clean to make a deeper MFS image (this might be tricky). You can also look for signs of Faraday Rotation by searching for a polarization angle change between the two spw. Can you derive the rotation measure (RM)? In spite of RFI, the antenna-based calibration is remarkably resilient to moderate to low RFI contamination (which tends to be baseline-based). So rather than flagging channels with RFI, you might try going ahead with calibration and seeing if the solutions make sense. We were able to calibrate this data without flagging channels (only getting the bad baseline noted above). There is no observation of a flux or polarization angle calibrator like J1331+3030. 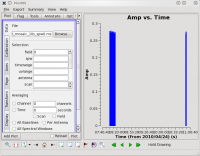 You need to use setjy to set the I flux of the gain calibrator. We use the approximate flux density of 5.8 Jy for J2038+5119. When it comes time to calibrate the polarization leakage, we are in good shape since J2038+5119 was observed through a range of parallactic angle (use plotms to plot versus ParAngle). Use parameter poltype='Df+QU' to solve for leakage and the unknown polarization of this source. We do not know the true polarization angle of this source, so before doing parameter poltype='Xf' ,use setjy to set the Q flux to 5.8Jy * fractional pol (determined in leakage polcal run). This will at least align the polarization when you image it. The L-band field of view is much larger than at C-band. From the VLA Observational Status Summary (OSS) the resolution should be around 45" in D-config. Use a cellsize of 15" or smaller. 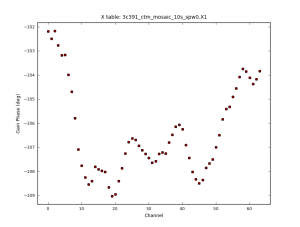 What is the primary beam of the JVLA at 1.4MHz? How big should you make your image? As you clean you will see faint sources all over the field; welcome to L-band imaging. This SNR has lots of structure&#151;try both standard and multi-scale clean. This page was last modified on 10 March 2016, at 18:13.